Looking for information on LTS Group Pte Ltd who is based in Singapore that sells Silicone Lunch Box. If you’re looking for information on this company, then read the below experience of one buyer who ended up having problems with this company so you make sure you avoid having the same problems also. This is Ningbo Huisen Rubber & Plastic Technology Co.,Ltd which a company is complaint by LTS singapore company in this website, so i must do something to protect our reputation. We produce the order according to LTS company requirements, and shipping them in batches, and now we finished the order, but LTS company reject to pay us the balance, and start a rumour that we are a bad supplier, I don’t want to write many to describe the course between us,and we also don’t want to say some bad words to describe LTS company, we just want to get our balance and LTS shipping their order as usual. I have provide the Alibaba judgment document here. 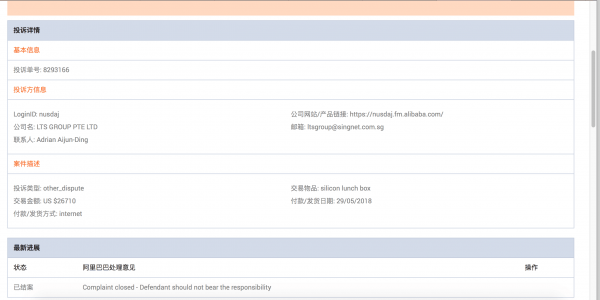 We have enough evidence provide to Alibaba, and Alibaba predicate our company is no need to bear the responsibility, so LTS company complain us here again. We can not bear they do such a bad things. Need More Info on LTS Group Pte Ltd? 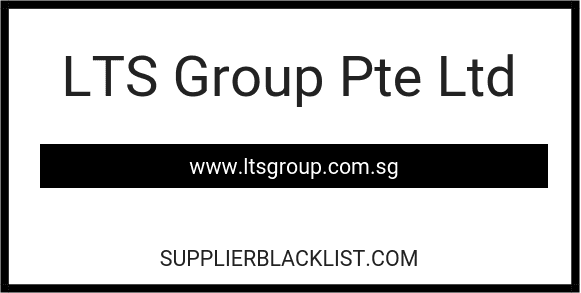 If you need more information, you can click the below links to search for more submissions about LTS Group Pte Ltd on Supplier Blacklist as well as go to the search results page on Google for more reviews online about this company. Perform a Supplier Blacklist search for more reviews on LTS Group Pte Ltd.
Search Google for LTS Group Pte Ltd Reviews.